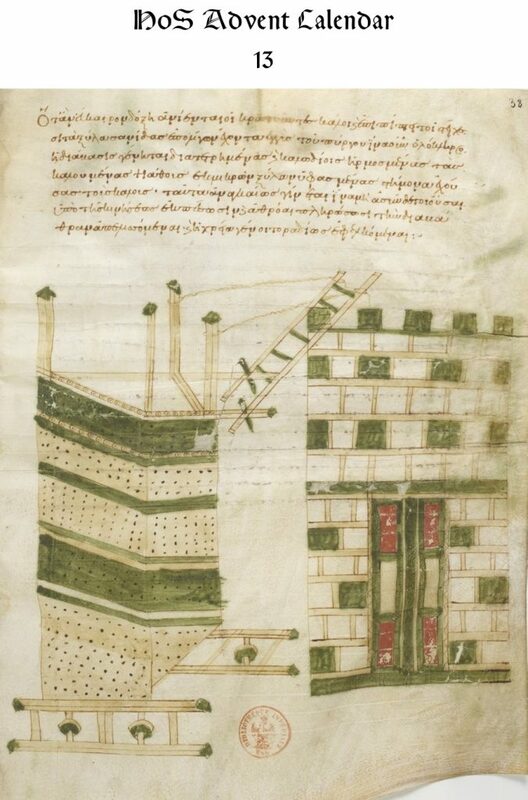 An illustration from a Byzantine copy of Apollodorus of Damascus’s “Πολιορκητικά” showing a siege tower with an assault bridge for scaling walls. This drawing is from BNF suppl. gr. 607, fol. 38r, a manuscript dated sometime between the 11th and 14th centuries. Apollodorus of Damascus is generally thought to have written the “Πολιορκητικά,” a treatise on siege engines, addressed to an unnamed emperor (probably Trajan). The text first treats siege engines used to besiege a hilltop fort, machines to protect troops from objects rolled down the hill as well as devices for protecting men attacking the base of the walls. It describes devices for drilling through walls and setting fire to walls as well as sheds for battering rams. The text also describes towers used to scale walls and invade a fort as well as towers with pivoting arms to sweep defenders off the walls. Apollodorus worked on various engineering and building projects for the emperor Trajan in the early second century CE. He was responsible for such projects as Trajan’s Bridge over the Danube during the campaign in Dacia, Trajan’s Column and Trajan’s Forum, various triumphal arches, baths, and other smaller building projects. During Emperor Hadrian’s reign, he was banished and then executed around 130 CE. Although Cosmas Indicopleustes is far from a household name, he enjoys an outsized reputation (at least in the abstract) as a representative of the benighted medieval belief that the earth was flat. To be sure, in his “Topographia Christiana” he says the earth is a parallelogram surrounded by oceans. Moreover, this parallelogram-shaped earth was stuffed inside a tabernacle-shaped cosmos. He thought the cosmos must be shaped like a tabernacle because its shape had inspired Moses to construct the Biblical tabernacle. 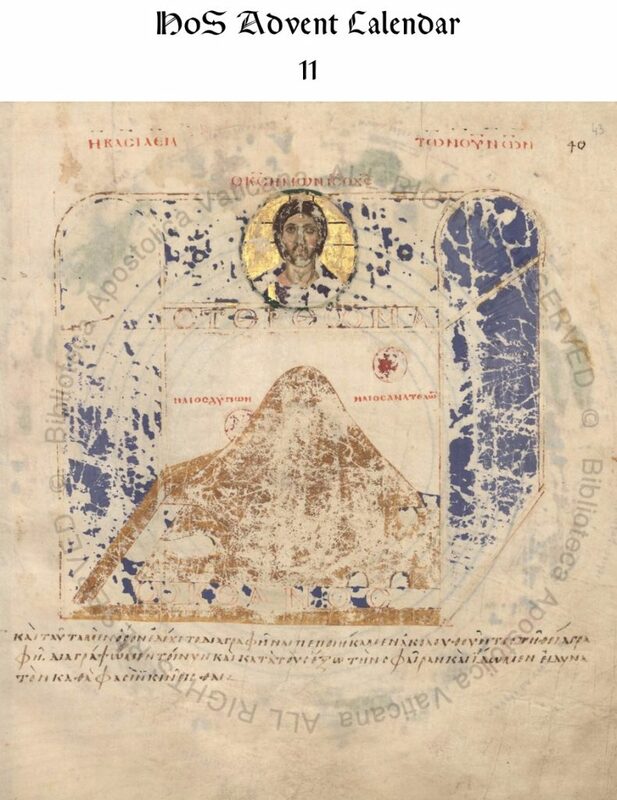 Cosmas was not, however, a geographer nor was his “Topographia Christiana” clearly meant to represent physical reality. Moreover, there’s little evidence that anybody before the late 17th or early 18th century cared about Cosmas’s ideas. This didn’t stop people like Andrew White from making up stories about Cosmas having influenced medieval ideas about the construction of the earth. Alas. 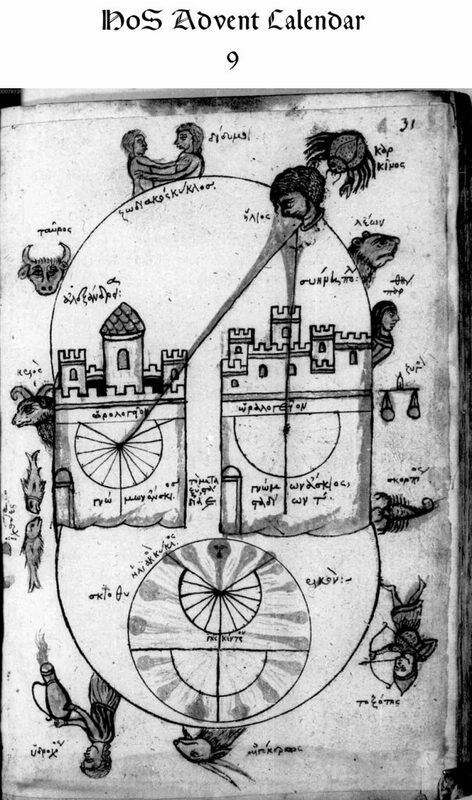 An 13th/14th-century drawing of Eratosthenes’ method for calculating the circumference of the earth. The sun shown at the summer solstice shines down on Syene and Alexandria. This drawing is in “Cleomedis introductio de motu coeli et planetarum,” BSB-Hss Cod.graec.482, fol. 31r. In this 13th/14th-century copy of Cleomedes’ textbook on astronomy, typically referred to as “De motu circulari corporum caelestium,” is this illustration of Eratosthenes’ method for calculating the circumference of the earth. The outer oval is the signs of the zodiac in their zoomorphic/anthropomorphic forms, each labeled with its name. The sun is located in Cancer, in the upper right, illustrated by a head looking down and the label “ἥλιος.” Rays of light stream down on two cities. On the right is Syene; on the left is Alexandria (labeled accordingly). The city walls of each are adorned with a sundial. The gnomon on the dial in Syene is casts no shadow, since the sun shines down directly on the city. The gnomon in Alexandria would clearly cast a shadow, since the sunlight shines on the town at an angle. Between the two towns is a distance of 5,000 stadia, as noted by the “τὸ μεταξὺ στάδια Ε.” In the bottom is an illustration showing the path of the sun. Cleomedes was a Greek astronomer active sometime in late antiquity (scholars don’t agree on when he lived). He is known primarily for his work, On the Circular Motions of the Celestial Bodies , a kind of textbook on astronomy. He preserves previous authors’ work, especially much of Posidonius’s work. He is also the earliest source for the story illustrated here about how Eratosthenes measured the circumference of the earth. 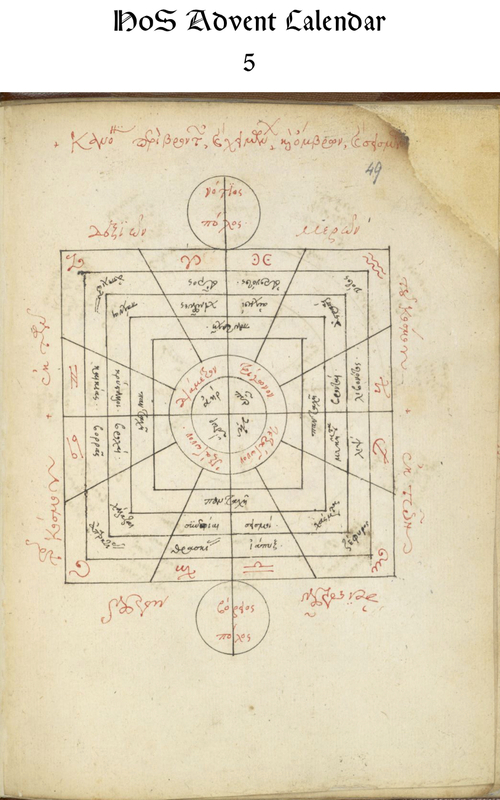 A 16th-century copy of a Byzantine wind diagram from Royal MS 16 C XII, fol. 49r. These diagrams have received little attention, which has (predictably) focused on the Latin tradition. 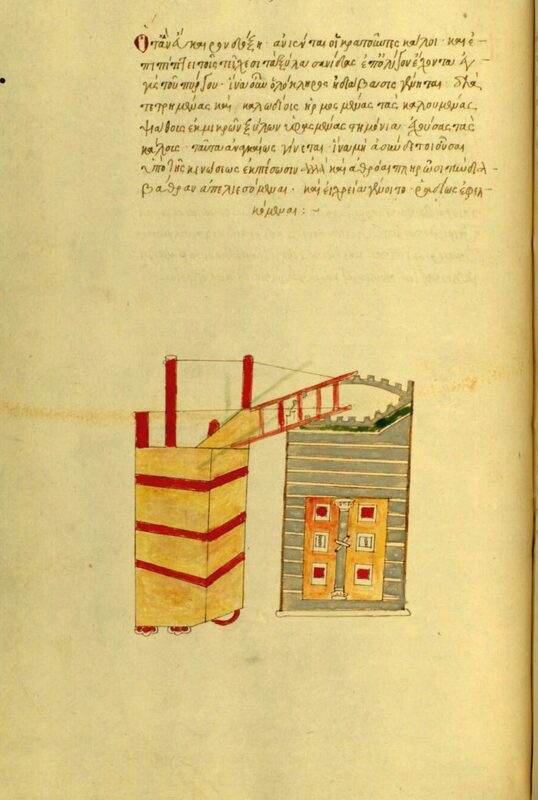 Such diagrams appear regularly in Byzantine astronomical manuscripts. 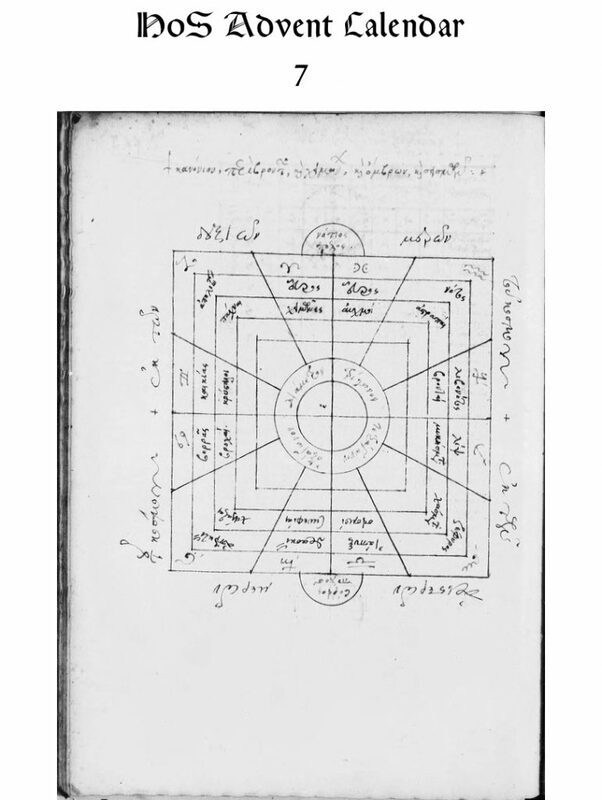 This diagram is part of a collection of astronomical/cosmological diagrams in Royal MS 16 C XII, a later 16th-century manuscript first owned by Isaac Casaubon, the brilliant classical scholar and historian. Other texts in the codex include the trio of texts on the astrolabe—Philoponus’, Ammonius’, and Gregoras’—as well as a printed text on the astrolabe by Nikolaus Sophianos.